For other uses, see Nereid (disambiguation). In Greek mythology, the Nereids (/ˈnɪəriɪdz/ NEER-ee-idz; Greek: Νηρηΐδες Nereides, sg. Νηρηΐς Nereis) are sea nymphs (female spirits of sea waters), the 50 daughters of Nereus and Doris, sisters to Nerites. They often accompany Poseidon, the god of the sea, and can be friendly and helpful to sailors, like the Argonauts in their search for the Golden Fleece. Nereids are particularly associated with the Aegean Sea, where they dwelt with their father Nereus in the depths within a golden palace. The most notable of them are Thetis, wife of Peleus and mother of Achilles; Amphitrite, wife of Poseidon and mother of Triton; and Galatea, the vain love interest of the Cyclops Polyphemus. They symbolized everything that is beautiful and kind about the sea. Their melodious voices sang as they danced around their father. They are represented as very beautiful girls, crowned with branches of red coral and dressed in white silk robes trimmed with gold, but who went barefoot. They were part of Poseidon's entourage and carried his trident. In Homer's Iliad XVIII, when Thetis cries out in sympathy for the grief of Achilles for the slain Patroclus, her sisters appear. 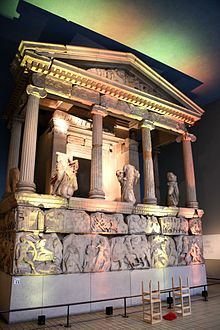 The Nereid Opis is mentioned in Virgil's Aeneid. 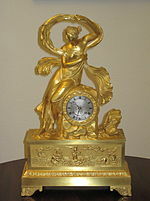 She is called by the goddess Diana to avenge the death of the Amazon-like female warrior Camilla. Diana gives Opis magical weapons for revenge on Camilla's killer, the Etruscan Arruns. Opis sees and laments Camilla's death and shoots Arruns in revenge as directed by Diana. 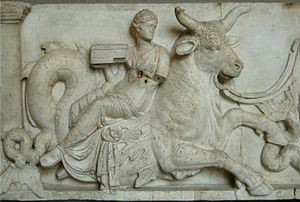 In modern Greek folklore, the term "nereid" (νεράιδα, neráida) has come to be used for all nymphs, fairies, or mermaids, not merely nymphs of the sea. Nereid, a moon of the planet Neptune, is named after the Nereids. This list is correlated from four sources: Homer's Iliad, Hesiod's Theogony, the Bibliotheca and Hyginus. Because of this, the total number of names goes beyond fifty. ^ a b Atsma, Aaron J. "Nereides". Theoi Project Greek Mythology. Retrieved 7 March 2016. ^ Parada, Carlos. "NEREIDS". Greek Mythology Link. Retrieved 7 March 2016. This page was last edited on 4 March 2019, at 02:22 (UTC).